Many of the houses and buildings here in Gračišće are unfortunately abandoned and in a derelict state. 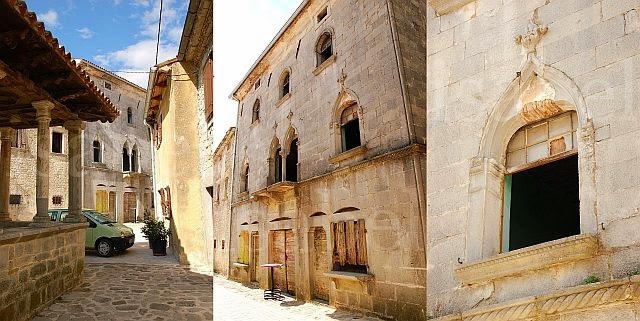 This is the fate of many villages in Istria because many owners of these neglected properties live abroad, or a property is divided among several heirs, or simply because people do not see the value of an old property and do not want to spend money maintaining it. Many visitors to Gračišće are intrigued by a derelict building on its main square, just opposite the 15th century church of St Mary and Konoba Marino. Despite its dilapidated state, the Salamon Palace (also often spelled 'Salomon' Palace) is still one of the village’s most striking buildings. Buildings often have interesting stories behind them. I’ve done a bit of searching through guidebooks and have spoken to the older villagers living here to learn more about the history of this intriguing building and try to understand why it’s been left to slowly decay. The Salamon Palace is part of the external fortifications of the village, a row of imposing three-storied buildings with thick walls and entrances on both the exterior and interior of the village. With its grey stone façade and Venetian-Gothic features, this building looks like it would belong in Venice. Its architectural features reveal a mix of styles. On the 1st floor, the windows are Gothic in style: they have pointed arches and a biforium – a double-arched window with a column separating them. The windows on the second floor are Romanesque in style with rounded arches and the cornice of the building was in Baroque style but this is not visible today. A small guidebook I have on Gračišće published by the municipality reveals that the construction of the Salamon Palace was completed 444 years ago, in 1570. Up to the first half of the 19th century, it belonged to the Italian noble family Montecúccoli, who had bought the county of Pazin (of which Gračišće was a part) from the Habsburgs in 1766. There’s no information on who its previous owners were. 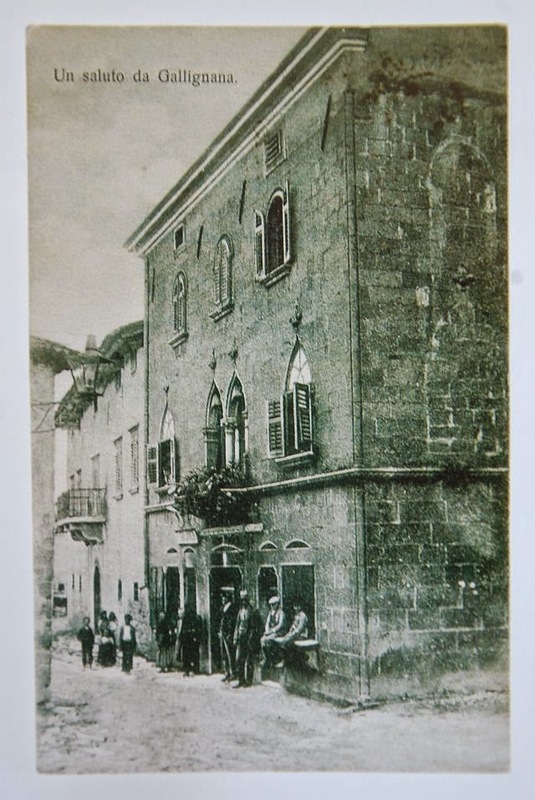 The palace takes its name however, from its most recent residents, the Salamon family who moved here in 1848 when Lieutenant Francesco Salamon became a national guard commander stationed at Gračišće. Its new owners renovated the palace in 1853 – the date which is seen above the imposing doors on the exterior side of the village. My father remembers the last generation of the Salamon family to live here. He had been inside their grand home (which must have contrasted sharply with the village’s other modest dwellings) as a young electrician to install an electricity meter. He had also learned French from Mrs Salamon, who taught at the village school. Tragically Mr Salamon had died during the Second World War at Dachau concentration camp, where he had been a prisoner of war (along with my grandfather, who luckily survived). Their son became a doctor and moved away to Pula, while Mrs Salamon remained in the family home. There was a grocery stone on the ground floor of the building, while the family lived on the upper floors. Today this lovely building, one of the most noteworthy in Gračišće, is a sight for sore eyes. It has stood empty for decades and is slowly crumbling. A patch of the beautifully painting ceiling is visible through the open windows of the first floor, but most of it has collapsed. Under the ledge of the biforium were three sculpted lions which I had captured with my camera in 2004 – 10 years ago – but only one remains today. I was told two of the stone sculptures were shattered when a delivery truck was backing up and accidentally hit them! Only one lion left today! The three lions are visible in this photo from 2004. The sorry state of the Salamon Palace brings up questions. The village of Gračišće has ‘protected status’ as a place of important national heritage, so how can it be that its buildings are left to crumble away? Wouldn’t the restoration work on such an important historical building located in a village under ‘monumental protection’ be the responsibility of the state, or the regional or local government? It’s difficult to find answers. When the roof collapsed a few years ago, people started to take notice. The Conservation Committee had ordered the owner to take action and repair the roof and cornice because of safety concerns. The owner at the time was the proprietor of a real estate agency who had put it back up for sale. (The ad is still visible at this link with a few photos of the interior.) Some people say that he had defaulted on a bank loan and that the palace has been repossessed by a bank, but this is hearsay. In any case, the roof was repaired about five years ago (it's not clear at whose cost) but it seems that until this decaying palace once again presents a risk to public safety, there are no on-going efforts to preserve it and restore it to its former glory. In the meantime, the Salamon Palace continues to slowly crumble away under the eyes of the patrons of Konoba Marino who sit at the wooden tables with a glass of Malvazija and admire its fading elegance. I was looking up the Salamon Palace and came across your Istria Out My Window. I notice you have spelled it Salomon--I believe this might be an incorrect spelling. When we visited the Palace a few years ago it was spelled Salamon on all of the historic signage and also in the guidebooks we had. Salamon is a common spelling in that area, and in fact, my husband's father is from that area of Istria and our last name is spelled Salamon. There are different local spellings for this surname: Salamon, Salomon and Salamun. I had used the spelling ‘Salomon’ because that’s the one which is used in my Croatian guidebook on Gračišće. I asked one of my neighbours who is a long-time resident of this village why there are different spellings. He told me that Salamon is the Italian spelling and Salomon the Croatian one. Also, there is a village nearby called Salamunišće, hence the other spelling of Salamun. So which one is ‘correct’? I imagine each family would say that theirs is the ‘correct’ one and all others are ‘incorrect’! But to be fair, since this magnificent building is named after the family who first occupied it, I decided I should find out once and for all, which is the ‘correct’ spelling. Unfortunately there is no historic signage here in the village referring to the Palace or mentioning its name – I would be curious to know where you saw it. My Croatian guidebook says that it was ‘poručnik [lieutenant] Francesco Salomon’ who moved into this building in 1848; this would be during Austrian rule. Francesco is clearly an Italian name, so his name may have likely been spelt ‘Salamon’. Also, I was told that a member of the same family died at Dachau. When I was looking for my grandfather’s name in the records and other prisoners from Gračišće when writing another post on the 70th anniversary of the liberation of Dachau http://www.istriaoutsidemywindow.com/2015/04/70-years-ago-today.html#.Vd3YTNKUffJ , I also found ‘Gastone Salomon’. However, in a war memorial monument here, his name is spelt ‘Salamon Gaston’. How confusing! So today I visited the cemetery here and found the family’s gravestone. It’s in Italian and their name is spelt ‘Salamon’. So since this is how they spelled their name and this was their house, I’ll change the spelling in this post. Thanks to your comment I may have solved the mystery! Dear Silvia, many thanks for your comment and for giving some historical background on your family. Yes, the commune had fixed the roof because it was in a dangerous state. But I'm very sad to see the building deteriorate with each passing day. According to the property records, the palace belongs to a property agency and it's under litigation, so in the meantime this beautiful building is just continuing to deteriorate. 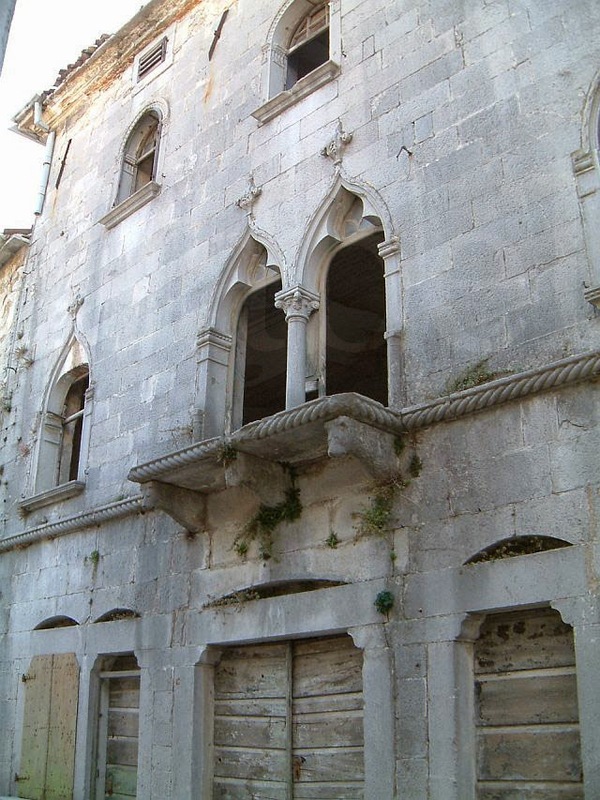 The sad state of many beautiful old buildings in Istria! I haven't looked at this site in a while and was glad to see you had found out more about the Salamon spelling. I have a photo of my husband with his cousin (she owns a house near Brda, which is where my husband's family lived--her last name is now Peculic) in front of the Salamon Palace sign. If memory serves me correctly, it was at the entrance of Gracisce. My husband is going to look for the photo. If he can find it, I will scan it to you. The photo was taken in 2005. We do not know what connection, if any, my husband's family would have with the Salamon family that owned Salamon Palace. We do know that his family was referred to as Kmet Salamon; and we were told Kmet means landowner. Thanks for the information you share with us.